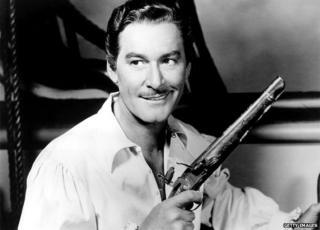 Love letters written by dashing 1930s matinee idol Errol Flynn are to be sold at auction. Flynn, who in 1934 had not yet achieved fame and fortune, wrote them to a girl he met while performing at the Malvern Festival. Marjorie Bickham, from Hill Top Fruit Farm in Ledbury, was the girl he was trying to woo. The letters will be sold at Fieldings Auctioneers in Stourbridge on 4 July, and are expected to make about £600. Nick Davies, from Fieldings, said he was surprised when he was offered the letters: "I'd been to visit a couple who were 'downsizing' and they said they had some letters from Errol Flynn and would I be interested? "It turned out that the letters were sent to [the vendor's] great-aunt, Marjorie Bickham - the girl he was trying to seduce." "Perhaps I could if I knew for certain you wanted to hear it. I'm going to bed. I know I shall think of you until I go to sleep. Image caption Flynn finishes one letter with the words "Gosh, I'm keen to see you"
Flynn met Miss Bickham four years before he found fame. He was at Birmingham Repertory, travelling to regional theatres. The first of the letters was written on a train while he was travelling to Scotland, and they continue for a period of four months. In one letter, Flynn promises to telephone Miss Bickham, and adds: "If you're out or anything, I'll leave a message. And then I'll ring again." Mr Davies said: "Sometimes he sounds absolutely desperate to go out with her". It is not known whether Flynn was successful in his romantic pursuit of Miss Bickham, but later in life he became known for his fast lifestyle and womanising ways, marrying three times. At the time of his death at the age of 50, Flynn was planning a fourth marriage - to his teenage girlfriend Beverly Aadland.